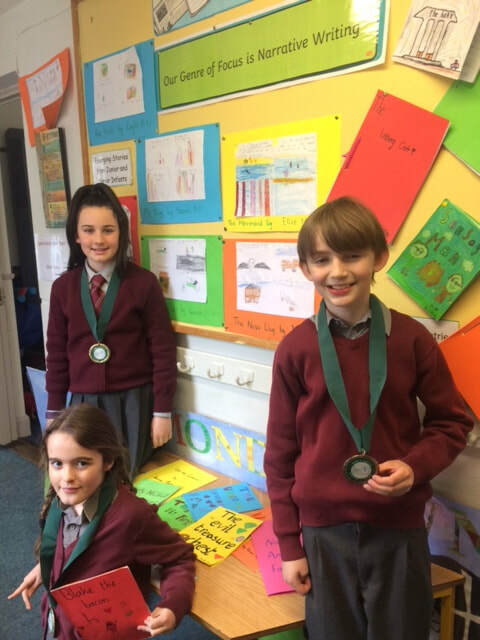 Congratulations to our "Write a Book" winners and to all the children from 1st class - 6th class who participated in the competition. Well done one and all! We were delighted to celebrate World Down Syndrome Awareness Day on 21st March. Everyone wore colourful socks and Marie, our SNA, gave an informative talk to each class. The Board of Management hereby notifies all parents that it conducted its annual review of the Child Safeguarding Statement and Anti Bullying Policy on 20th March 2019. These are available to download under the "Policies" tab. 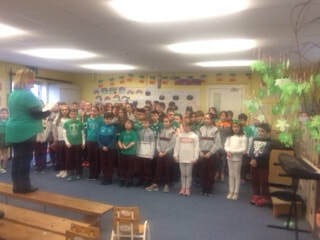 We held a Ceolchoirm on Thursday 14th March and also a mini feis. 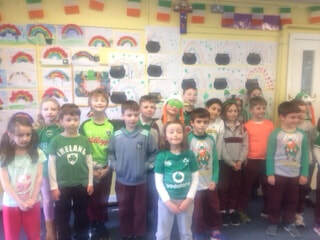 The children dressed up in green, white or orange. 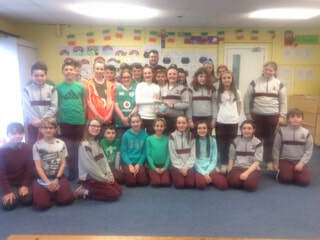 Congratulation to Mr. O'Dwyer and 5th and 6th class on their wonderful participation in Science Blast in the RDS. The children had a great time investigating slime. 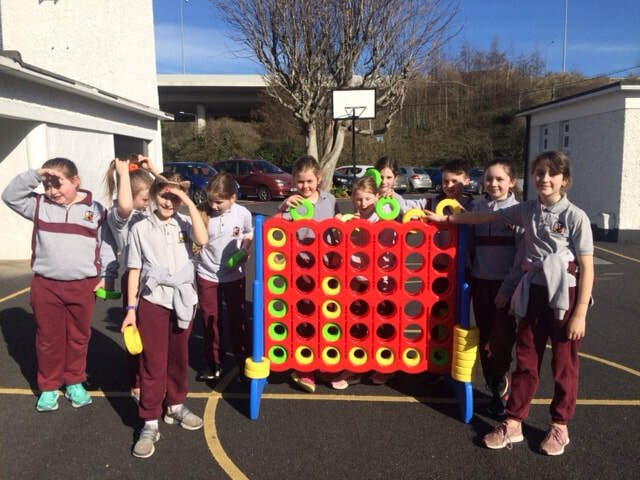 Young Entrepreneurs In 3rd & 4th Class Made Enough Money to Purchase a Giant Connect 4. Thank you boys and girls and well done! What a wonderful event we had on Grandparents' Day. So many Grandparents' came to visit us at school and we had a lovely ceremony in the school hall. The Student Council led the preceedings and were fantastic! The Parents' Association provided a lovely cup of tea with delicious home made cakes. 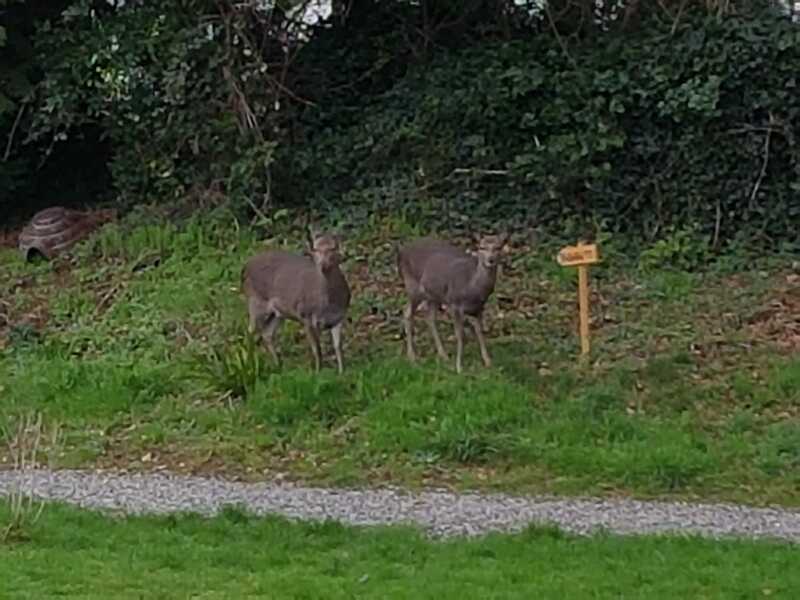 ​ Irish Wildlife Trust Awards! The children from 1st and 2nd class had a great trip up to Killakee Christmas Tree farm last Thursday 6th December. Many thanks to Karen and Justin Morton for organising the great workshop. The RTE cameras were there - check them out on the player at News2day. Our Parents' Association are busy making beautiful crafts with all the children this week. These will be on sale at the Christmas Fair - watch out for your child's creation! 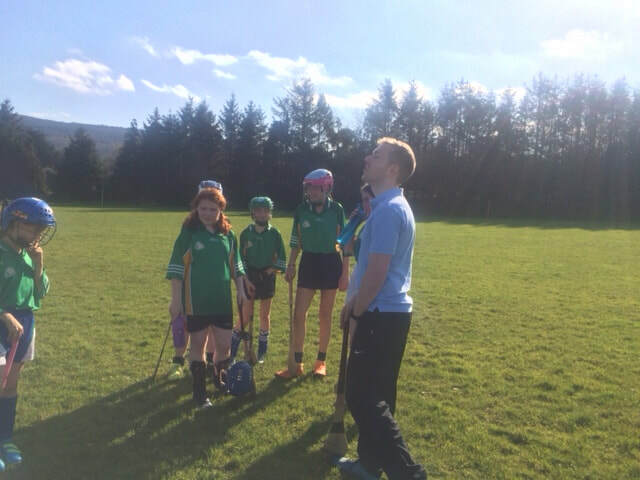 On Sunday the 14th of October, Edmondstown will host an Open Day Event for all prospective pupils. Come and visit us from 12:00 - 14:00. Now enrolling for September 2019. 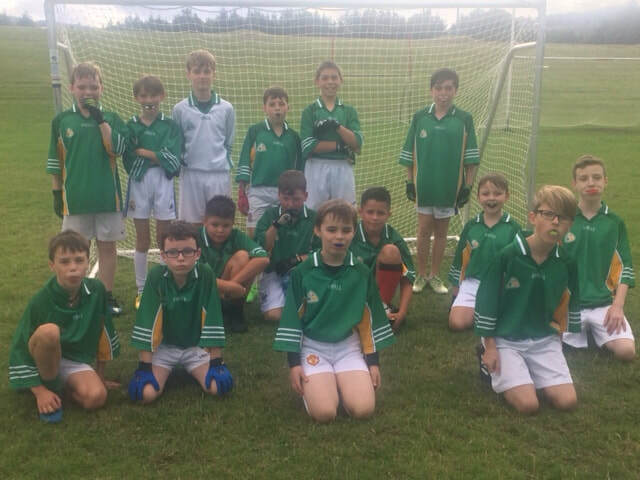 The boys and girls from 3rd - 6th class are participating in the Cumann na mBunscol G.A.A football competition. Have a look at our G.A.A page here for more details. 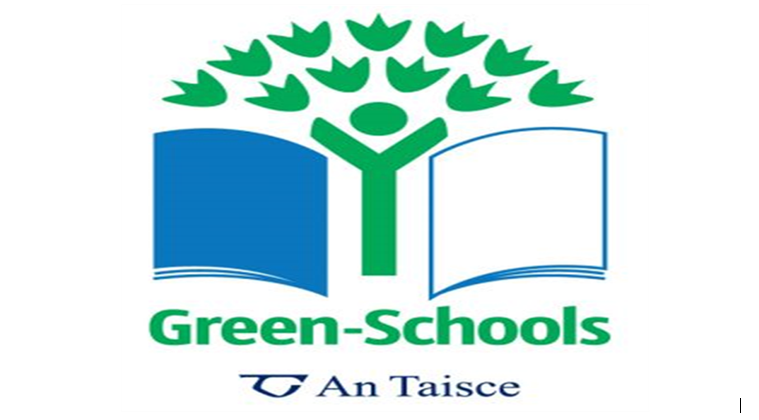 We are delighted that KIDS INC after school care is up and running onsite in Edmondstown School. Contact Kids inc on 01 6215790 for more details. After school care will be available from 1.30pm - 6.30pm Monday to Friday and during school holidays. What a fantastic Sports Day we had on 8th June 2018. The sun shone and everyone was smiling. As always it was all about fun. Congratulations to one and all. Check out lots of action photos under our events tab here. 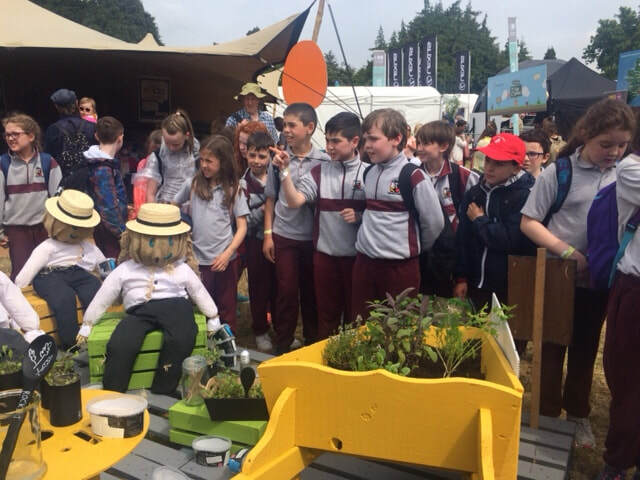 3rd & 4th had a wonderful time checking out the flora and fauna at Bloom. Click here for more pictures. 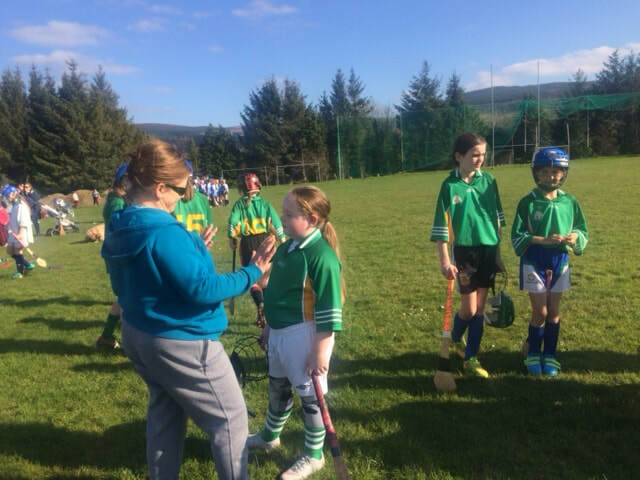 Edmondstown N.S. has just been awarded the Scoilnet "Star Site" award! 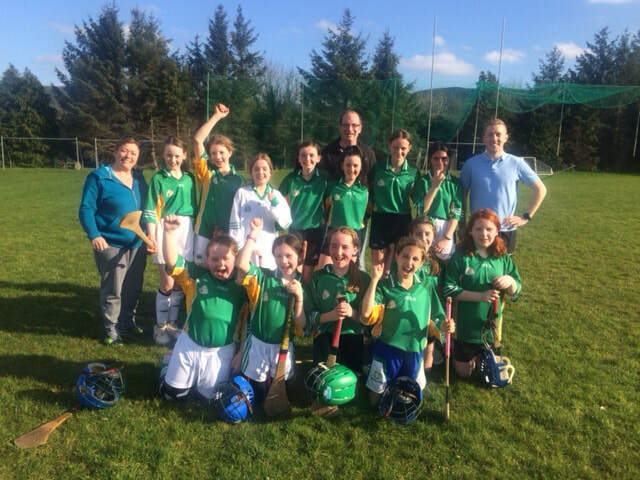 Edmondstown N.S. was awarded our 5th Green flag for Biodiversity on 22nd May 2018. Click here for more photos. All classes took part in Drop Everything & Read. Click here for photos. Everyone had great fun at the Book Fair on 5th June. We love reading in Edmondstown! More Photos - press here. 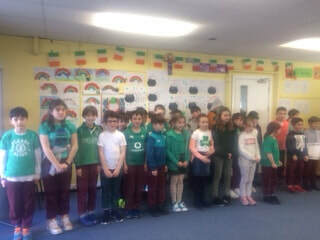 3rd & 4th class had great fun bee chasing on International Biodiversity Day! Click here for more photos. Bishop Eamonn Walsh conferred the sacrament of Confirmation on the children from 5th & 6th. 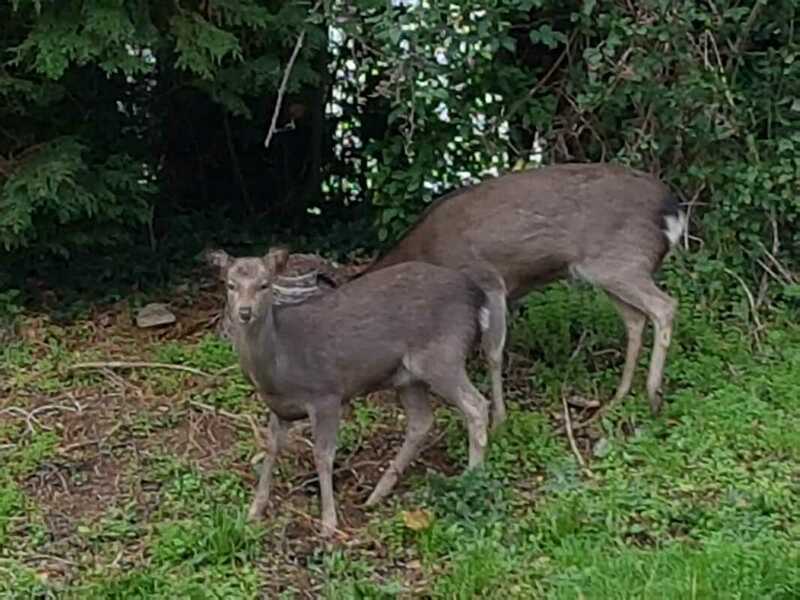 Check out the lovely photos taken by the Behan family here. 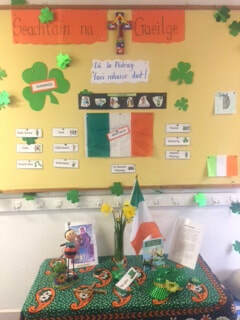 Céad Míle Fáilte to our website. We hope you find the content informative and interesting. The children and teachers of Edmondstown enjoy updating our website on a regular basis. The content here should give you a little insight into what goes on at our lovely school. If you have any comments to make or suggestions for possible improvements, do not hesitate to get in touch through the “Contact” tab. Happy Surfing! Click on the Engineers Week logo below to discover all the fun activities our school has been up to! Click here to see some more photos of Edmondstown during our recent snowfall. Click on the logo to see all the work we have done for Science Week. 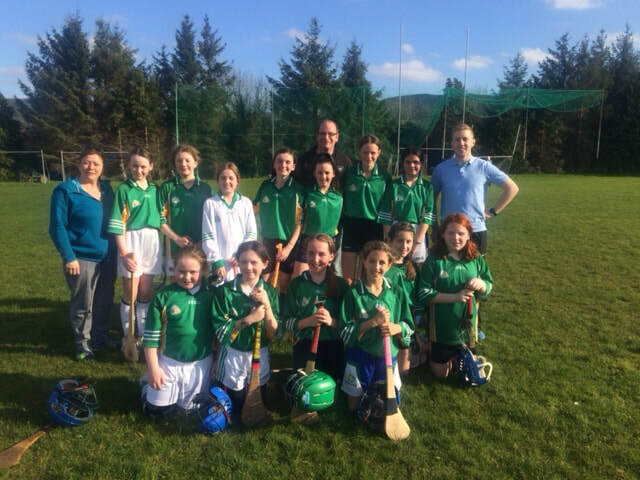 ​Edmondstown hosted our now annual "Grandparents' Day" on Friday 2nd February 2018. We were so thrilled with our visitors. Check out the lovely photos on our Grandparents' Day page under the Special Events tab. Click on the logo to see all the work we have done for Space Week. Click on the logo to see all the work we have done for Maths Week.